The Scottish Episcopal Church is part of the Anglican Communion and we welcome visitors from all over the world; many return to join us year after year and renew friendships. Our congregation is drawn from a wide area in the east of Caithness with members as far afield as Freswick in the north, Lybster in the south and Watten to the west. St. John’s is situated in an attractive site on the corner of Francis Street, the main road into Wick from the south, and Moray Street. There is a church hall further along Moray Street with the usual facilities where we meet for coffee and a chat as well as for fund-raising events. 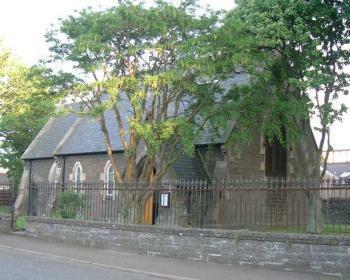 The church, designed by the architect Alexander Ross, was built in 1868-70 and has seating for approximately 110 people. It became a Category B listed building in 1997. The visual appeal of the church is often commented upon both by visitors and local people, and the interior, which has a warm friendly atmosphere, is always appreciated due in no small part to the impressive stained glass windows. There is a pipe organ by Harrison of Durham in the chancel and in recent years St. John’s has been a venue for musical evenings and concerts. There is also a beautiful, well kept garden maintained by dedicated church members who ensure a regular welcoming display of flowers (weather permitting!). Additional services where possible on Holy Days, Church Feasts etc. On 11 November 2018, 100 years since Armistice, bells will ring out in unison from churches and cathedrals in villages, towns and cities across the country. As part of "Her Majesty's Government" ambition for Bells to ring out at 12.30pm on the 11th of November, to commemorate the centenary of the Armistice, which signalled the end of the First World War, a team of some of the Poltney Bell Ringers will join the congregation of St John's Scottish Episcopal Church, Moray Street, Wick on Sunday 11th November 2018.